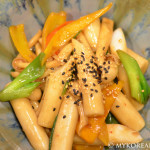 With the abundant use of tofu here in Korea, many of the restaurants that I have happened to stumble upon serve it in ways I never thought imaginable (plain, boiled, steamed, stir fried, fried, coagulated, uncoagulated you name it). 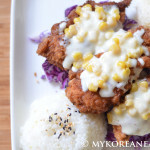 And lately, I have been itching to fry something (Korean fried chicken came to mind) and thought that tofu would be ideal. 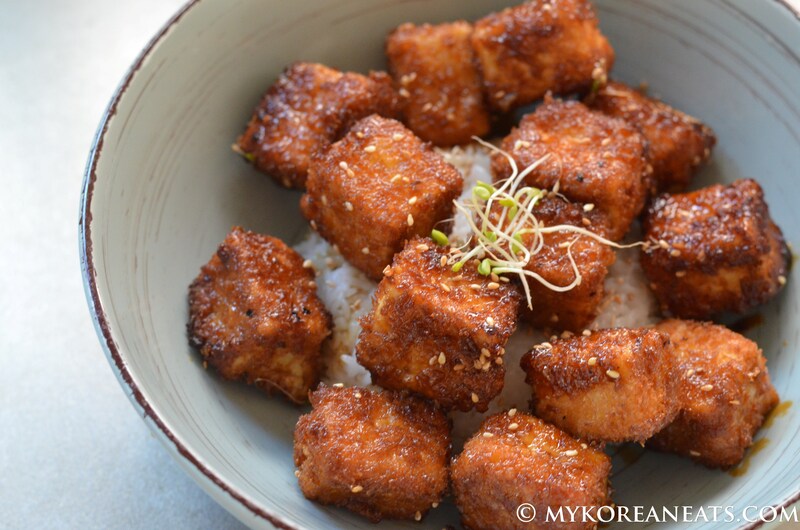 I personally love using tofu because it’s so versatile, always healthy, and can really make a great snack (or in this case a meal) when done the right way. 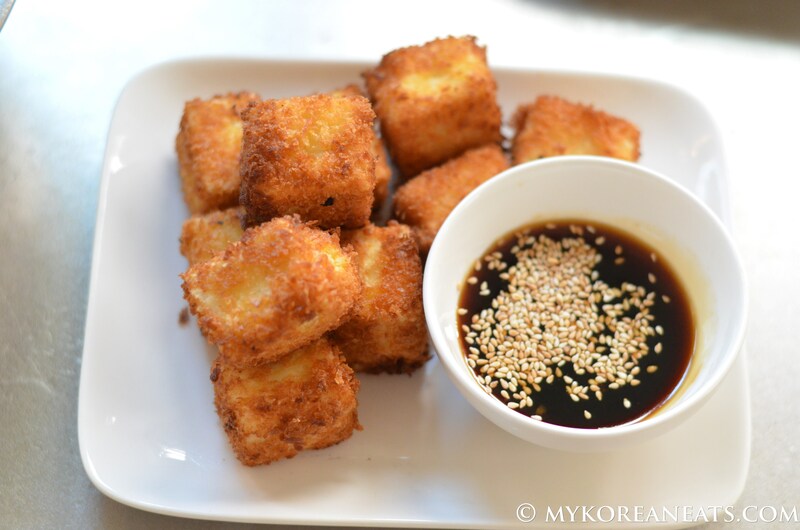 Using the same method to make donkaas aka tonkatsu (breaded pork cutlets), I diced up the tofu into bite-size cubes (halving or quartering okay too) before dredging them in flour, beaten eggs, and bread crumbs, respectively. 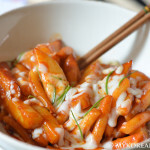 Besides that, just give them a good fry for a short while and make the sauce (easy stuff). 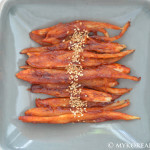 For a healthy snack or light meal, give this recipe a try. Here are the main ingredients needed for this dish. After dusting in the flour, coat the tofu pieces in the beaten eggs. 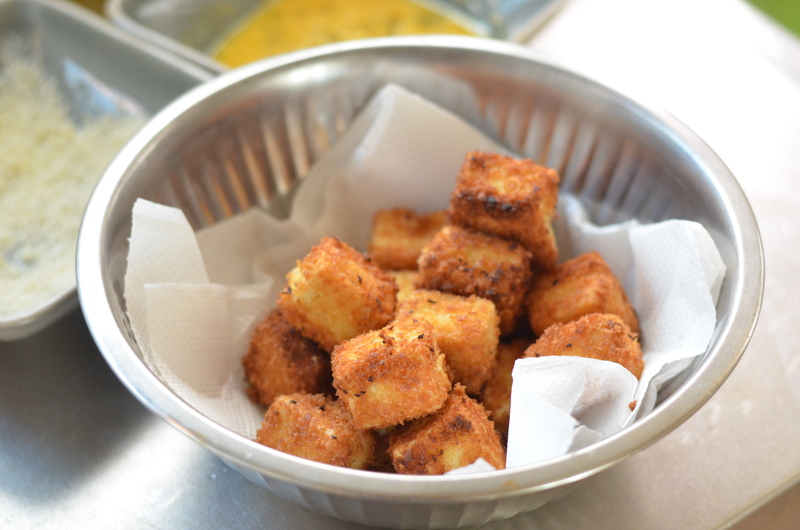 Carefully coat the tofu pieces in bread crumbs like this. 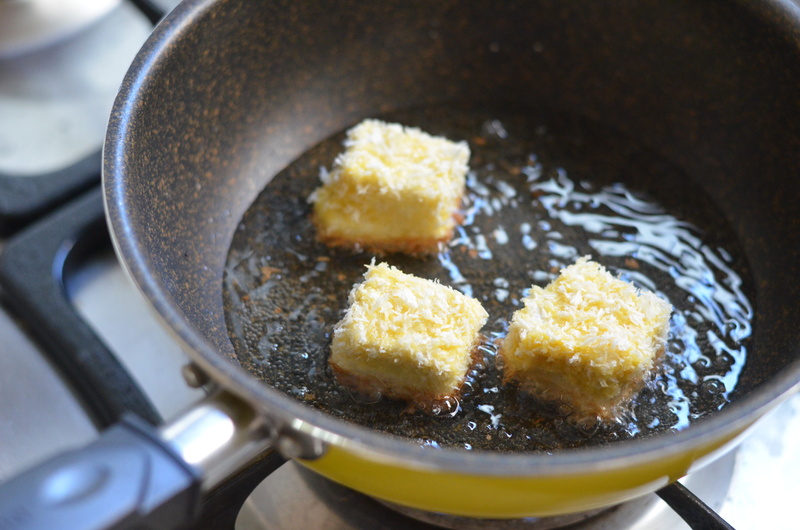 Fill the pan with oil at least 1cm in height, then fry tofu pieces a few minutes on each side or until browned. Set aside in paper towels to absorb excess oil. Boil the sauce down to a glaze using a combination of soy sauce, sesame oil, sugar, apple vinegar, honey, garlic, and ginger. 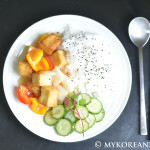 After straining the sauce, mix the breaded tofu pieces and coat evenly. Either eat alone or pop it on top of warm rice like I do here. They look a like tater tots but probably a tad healthier. 1. First drain tofu of excess water by slightly pressing with paper towels or by hand. Then cut into desired cube pieces, set aside. 2. 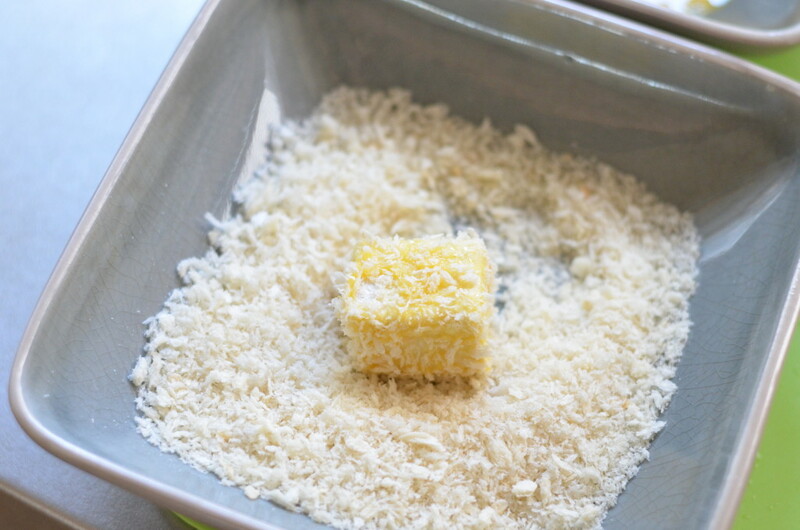 Next, prepare the 3 shallow bowls for the breadcrumbs, beaten eggs, and flour. Bread the tofu by dredging it first in the flour mixture, then in the beaten egg (let excess drip off), and finally in the breadcrumbs. 3. Fill a pan or skillet with at least enough oil to submerge halfway (approx. 1 cm will work). 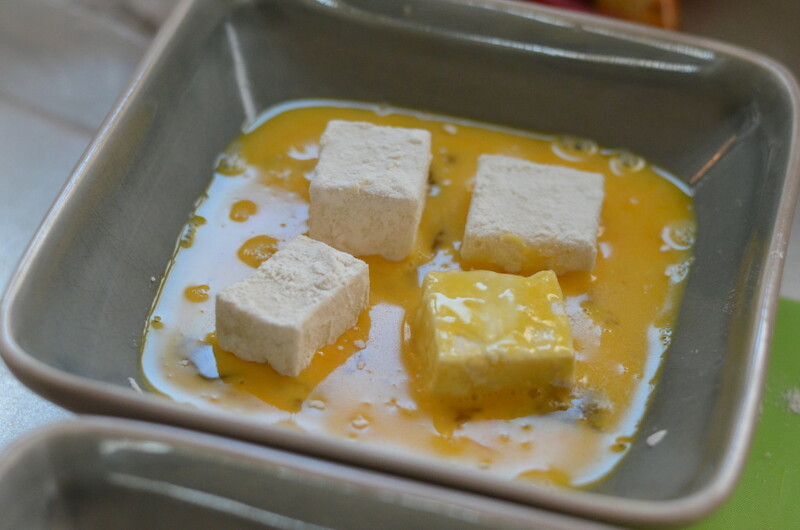 Heat the oil on medium for several minutes before adding the tofu pieces. 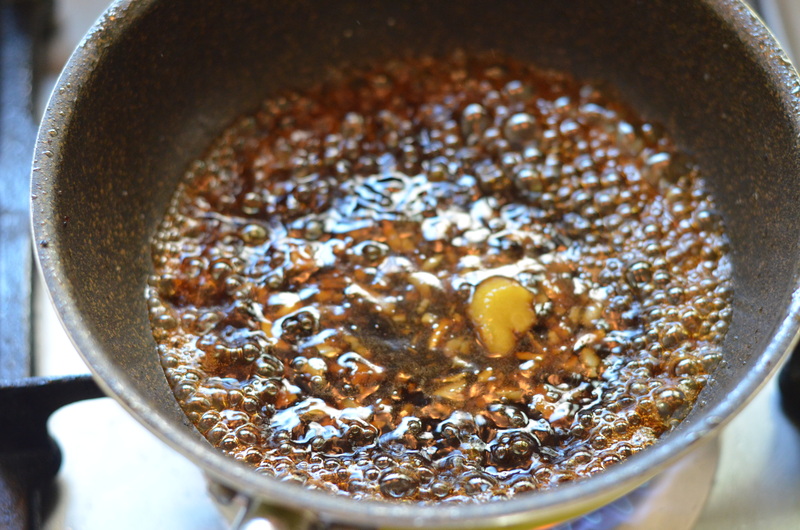 To test if the oil is ready, throw in a few breadcrumbs and they should bubble immediately. Fry the tofu pieces until golden brown, turning over when evenly browned on both sides, a few minutes for each side should do. 4. 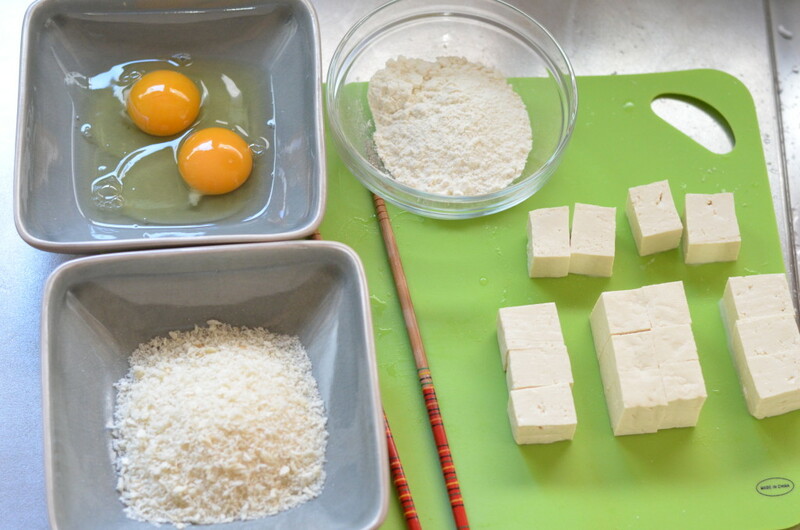 Carefully transfer the tofu to a plate lined with paper towels, and repeat the process for the remaining tofu cubes. Let the tofu set for a few minutes to cool before serving. 5. Prepare the sweet soy sauce (a la teriyaki sauce) by adding all the ingredients in a sauce pan. Boil on high until the mixture turns into a semi-thick syrup. 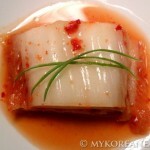 Transfer to a dipping sauce dish and serve warm.